This topic contains 61 replies, has 10 voices, and was last updated by Mr. Average 3 days, 17 hours ago. My brain fired off in a strange direction while I was overworked this past month, and the result was that I dug out some of my O8 “Not-Colonial Marines,” augmented them with some NATO infantry, and began assembling what may be a nice force for a joint Anglo-American operation on Linna 349 (one of many engagements alluded to around the edges of the Colonial Marines Handbook). More straightforwardly “military” than other forces I’ve done but still pretty effective, I think. Forgive the photos – I had to boost the contrast because of the lousy lighting in my house. It’s a supported interface Marine platoon, with three Smartgun teams, an Antitank missile launcher team, two M577 APCs, and two M40 “Ridgeway” Main Battle Tanks. The aircraft are Polish-designed AD-6 “Wrona” dropships, configured in the United States as the UD-12D “Arapaho” heavy lift dropship. They were favored over the better-known “Cheyenne” dropship because of their increased bay size and heavier thrust, allowing them to transport tanks and artillery to the surface of Linna 349, as well as Marines and APCs. On the table now are a second platoon, artillery support, and the beginnings of a British force with hovercraft and powered armor support, and some garrison troops from the Pan-African Conglomerate that have been trying to hunt down insurgents along Highway 3, near the city of New Harare. The insurgents, for their part, are armed with weapons and some older-model Chinese and Russian tanks and armored vehicles they looted when they took New Harare. 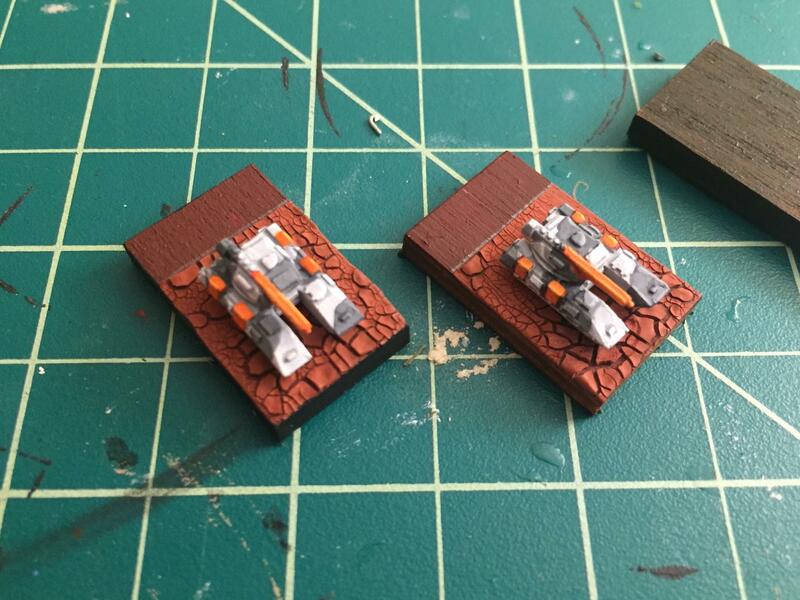 Like so many of my gaming ideas, I have no idea if this has legs or not, but I like to have the freedom to dabble in things to just see where they go, and since I’m using bits from my lead stock, the cost is basically nil – just finding new uses for as-yet unassigned minis. Ruleswise I’m torn between DS2 and Strike Legion Tactical. Suggestions welcome. We’ll see what comes of it. Once again, beautiful stuff, Mat! 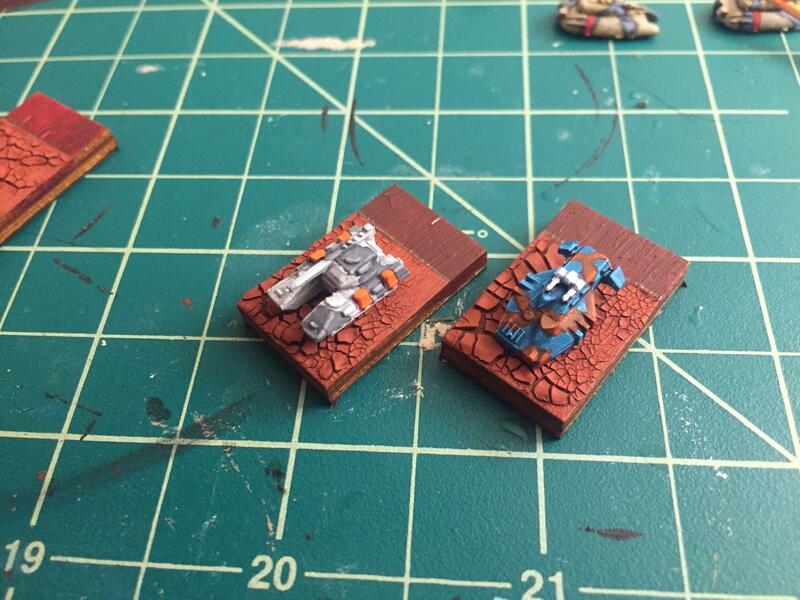 I had this same urge a couple of years ago, but painted mine tan and highlighted with red and orange. Like you, I just had to do a unit based on Aliens, even though it didn’t fit into any of my armies. The mobile artillery piece O8 produces are also from Aliens. 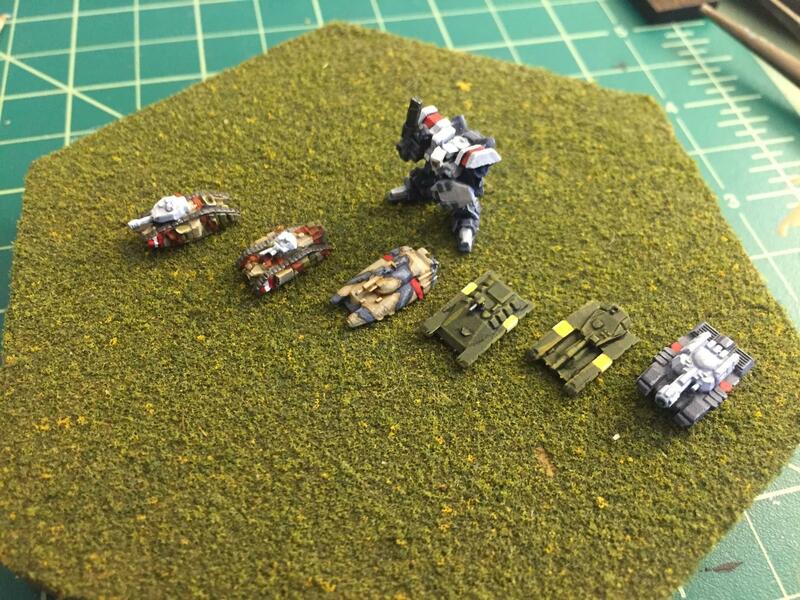 Lovely brush work on those mini miniatures. They are very nice. Looking forward to seeing your Brits. As for your rules. I would highly recommend you look at Iron Cow by Wessex Games. They are aimed at 6mm / 1/300 but will work with 3mm. DS2 is a good solid set of rules, has s nice design system so you can build your vehicles. not played Strike Legion so I can’t comment there. Awesome work! It’s a great start. Are you playing that each dropship can carry two vehicles? This reply was modified 1 year, 3 months ago by Thaddeus Blanchette. I haven’t quite decided yet. I don’t want a game with a ton of VTOLs buzzing around, so I’m giving myself the option with the UD-12D to do two per ship. I don’t want to eliminate them altogether but I don’t want to overdo it. The problem with Dropships in game form is that they either do their job and then leave in one or two turns, or they linger and then you have this airpower-centric force that is a little skewed. I mean, in real life you WANT to skew the battle in your favor but it’s not as much fun on the tabletop. I’m actually reading though FFOT3 again to get some ideas how to handle it without making the game a drag. Apparently, great minds think alike. That or cool minis and idle hands are the Devil’s workshop. Something like that. I did these and a bunch more a couple years of ago and still don’t know what to do with them. They could almost be your Brits, except for the American roundel. Forces from another member of the United Americas, perhaps. Paraguayan SOF troops on special strike duties! Although I admit that I’m using similar colors for my British – tan and brown I think, maybe blue-grey highlighting. I don’t know if I like the orange/red highlighting. That may change. But at least they combine with my “Tan Army”, so they may stay this way, too. I’m also using venerators on the theory that as long as one is going in light via airdrop, one might as well go in as heavy as possible. But yes, the Brits get Venators as stand-ins for “apesuits,” and Slammers style hovertanks. Thanks man! This is my argument in favor of a lead pile, albeit one at 3mm scale. It gives you the freedom to do little projects like this pretty much on a whim. Plus, 3mm is dead cheap. My entire Marine distraction cost me less than 20USD. Incidentally, I’ve spent a very pleasant day perusing a lot of different rules. I looked through Strike Legion Tactical, Platoon Leader, even Battletech, and in the end I’m leaning heavily towards DS2 since it does pretty much everything I want it to in a package I’m happy with. 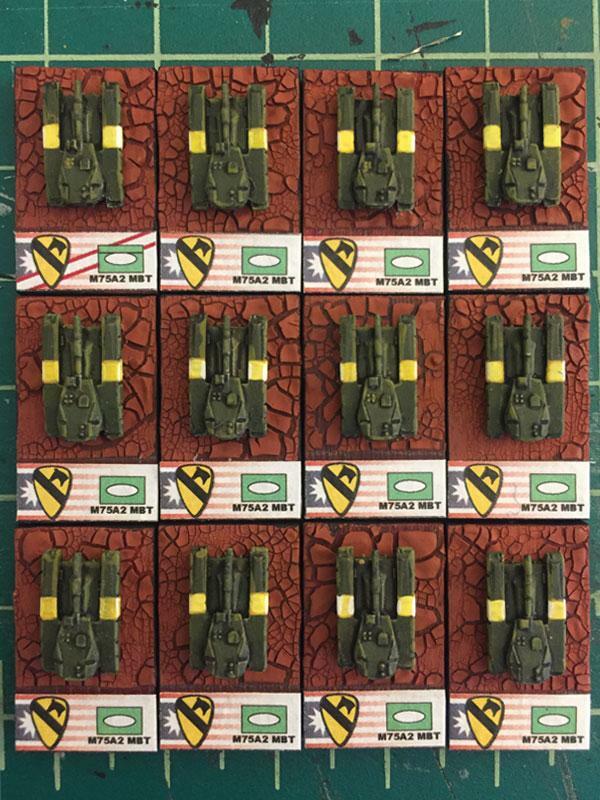 My thought is that the main USCM force (two Marine platoons, a Tank platoon and two flights of Arapaho heavy dropships) will be a pretty balanced force to start with, possibly supported with some artillery, or a separate command platoon with an AAA vehicle, some Mortar Carriers, and a command APC (and maybe a Marine Medevac, if I feel like being super-close to a Stryker company). In game terms, I’m not going to try to design the UD-12D dropships to “legally” carry two actual physical units, which would be wasteful of their potential and overprice them in game terms for a single-use system. Instead, I think I’ll just model the units such that they simply pay the cost for “interface landing” ability, instead of actually being physically toted around the battlefield one dropship at a time. This makes reasonable combat sense in DS2 terms, as well, since ADS and LAD units are pretty hard on air units generally. My rationale, in game terms, is that it’s not until the UD-12D ships drop their cargo of tanks and/or APCs that they become effective combat units for air support. Deploying with an extra 70+ tons of armor, stores, artillery and infantry would make the Arapaho difficult to use for anything but LZ-clearing if they were fully laden. Once the bay is empty, it’s far more agile and would linger in the neighborhood to provide fire support from its bevy of guided and unguided missiles (or wait for an emergency evac call, at which point it would load up, fire the boosters and head for orbit posthaste). This means they can’t really do the Pikop Andropov maneuver on the battlefield but I tend to think that won’t really be something I’ll be interested in doing anyway at the scale of game I’m likely to play. So I think that pretty well sets my mind at ease re: the “interface” portion of the USCM tactics and design. So if you know DS2, that means that the M577 APC and M40 Ridgeway Tank will both be Size 3, the M292A2 Armored Artillery Vehicle will be size 3 or 4, while the UD-12D Dropship is Size 5. Easy. The British are another story altogether – they will be descending (when they descend) in superheavy armored “Aurora” class ISSCV dropships that carry a whole combined arms company in one supercharged, armor-laden labor-saving operation. The “Aurora” is a Royal Navy interface lander that will simultaneously rain down close air support on the LZ as only the Royal Navy can, but then return to orbit once the cargo is unloaded to prevent the enemy from zeroing in artillery on it while it’s on the ground. What are you thinking of using as n OpFor? A lot of militia, some Thor MLRSs, and some T228 Tanks, for starters; probably with a bunch of those ten-wheelers for the insurgents to misuse as MBTs in the early stages. Down the line, if I buy any new vehicles, I might possibly add some technicals on the back of pickup trucks, or if that’s too modern, maybe some of the “Weird War I” units as repurposed agricultural vehicles. Check out the upar ored trucks the U.S. uses inIraq. You know I’ve thought of DZC, but I wasn’t 100% in love with the amount of modding that would be required to shoehorn in my specific game goals. It is definitely a fun game that has gotten short shrift at the club, unfortunately. Maybe I should try a revival… but that’s a game for another thread. 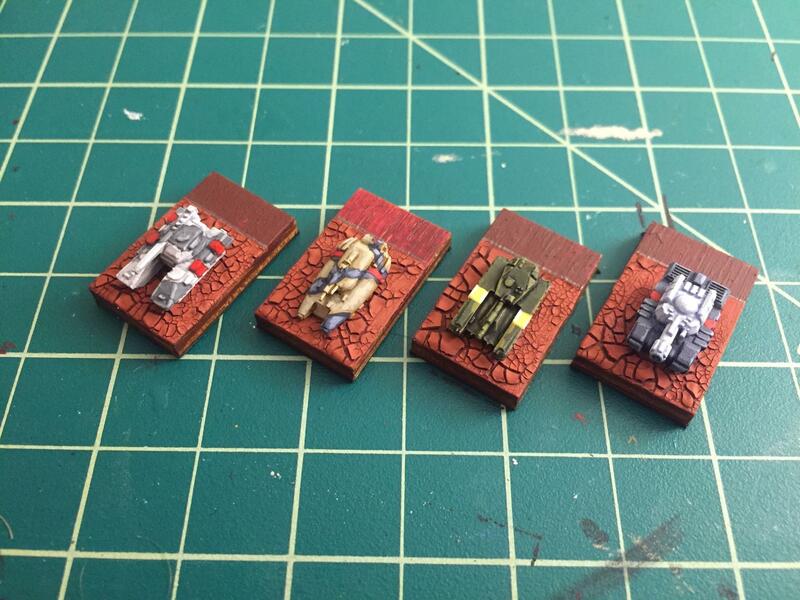 The Colonial Marines are getting support – the Army keeps rolling along! These are some M75 “Westmoreland” tanks from the U.S. Colonial Army, First Cavalry. They’re taking over a lot of the heavy fighting during the drive on the Chinese/Russian Confederation positions in Port Nyrere on Linna 349. 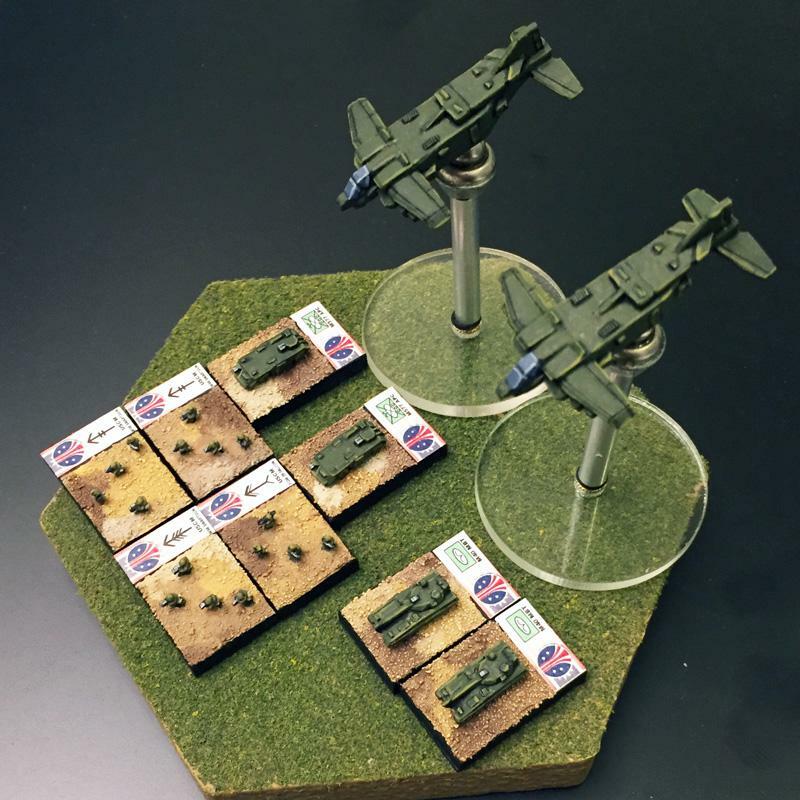 These are the excellent new line from Microworld Games. You do a fine job, sir! Are those the new minis from the shapeways guy? A size comparison – I’m working on the USCA and some European Union forces in the form of an advanced repulsortank unit, the MDR Earthlight Division. Also shown, O8 Retro, National Cheese Emporium 3D Print, and a DP9 Fleet Scale Mech. 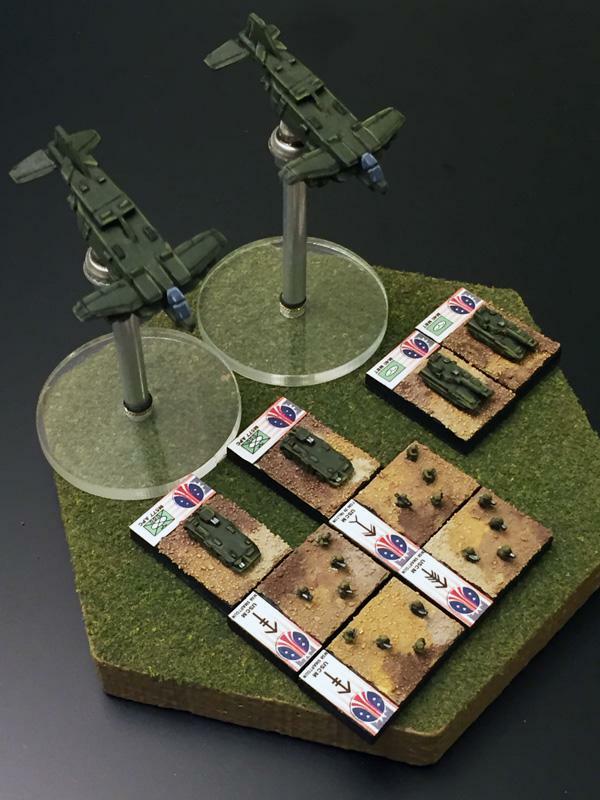 All very nice models, but I’m particularly pleased with the Microworld 3mm offerings. Very clean casts and a pleasure to paint! Yeah, that Microworld grav tank is very nice! I am going to have to get me some. Yeah, up to now good Grav vehicles have been lacking – these and the O8 Drahh’z are filling the gap at last. Really looking forward to AARs! I’m not overly familiar with DS2 or SLT, so definitely eager to hear your take. The green and yellow look just right. Getting “Colonial Marine” vibes for sure. The USCA is prepping the First Cav for departure. 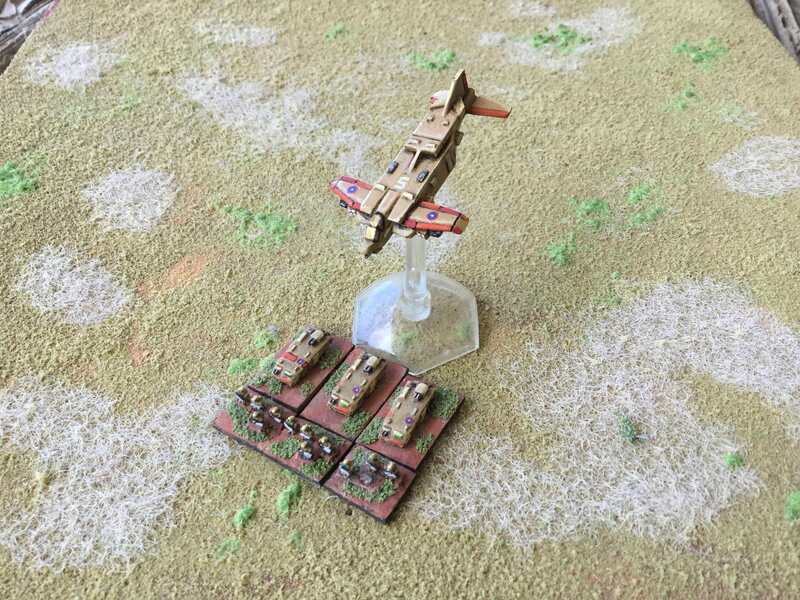 The Federal Republic of Hellas Planitia, a colony in Free Association with the United States, has come under attack by forces of the Mars Liberation Army, and the US and UK are about to launch Operation Turbo to help them defend the Hellas settlements. L to R: FRHP Defense Force tank; EU “Earthlight Division” Super Panzer IV; USCA M75A2 Westmoreland MBT; JGSDF Type 209 Tank Destroyer. The EU is conducting parallel operations with the Russian Confederation under the code Operation Caged Saint, and the JGSDF is working with China and Australia under the code name Operation Weather. Still, with the distance from Earth, the MLA has a definite advantage, at least in the early going. Beautiful work as always, Mr not-so-Average! Always amazed at how you get your colours to look so rich, and yet have so much ‘pop’ in this small scale – and Wowser! 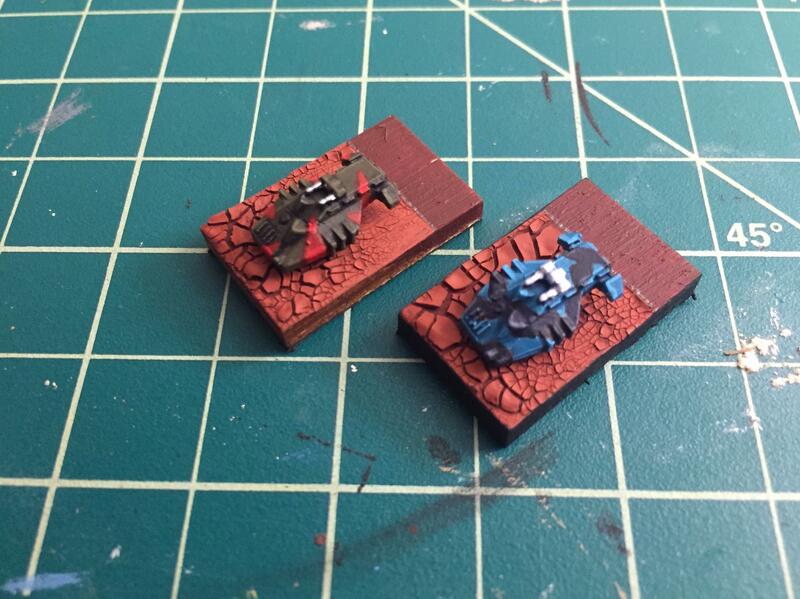 – those bases in the final pic – how did you do that ‘crackleur’ Martian-style surface – that is such a cool paint effect! Thanks man! Kind of you to say! 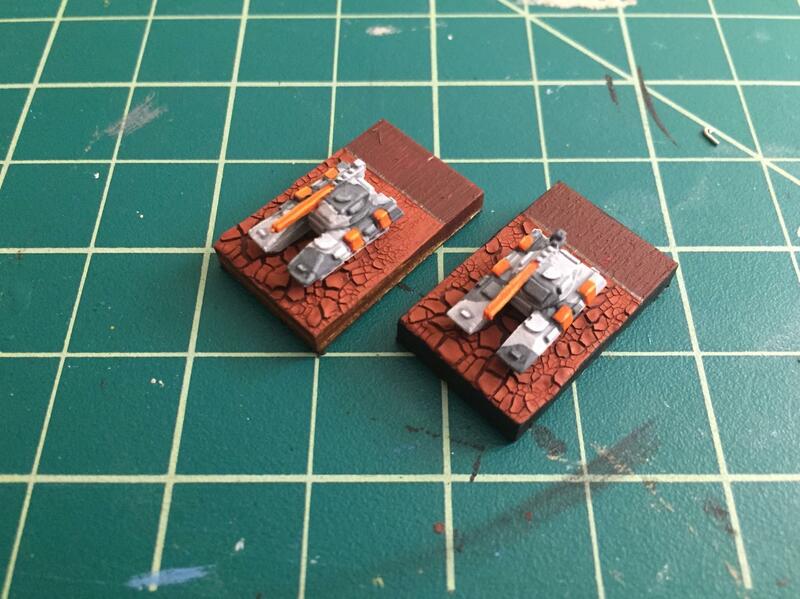 The basing is “Martian Ironearth” from GW. 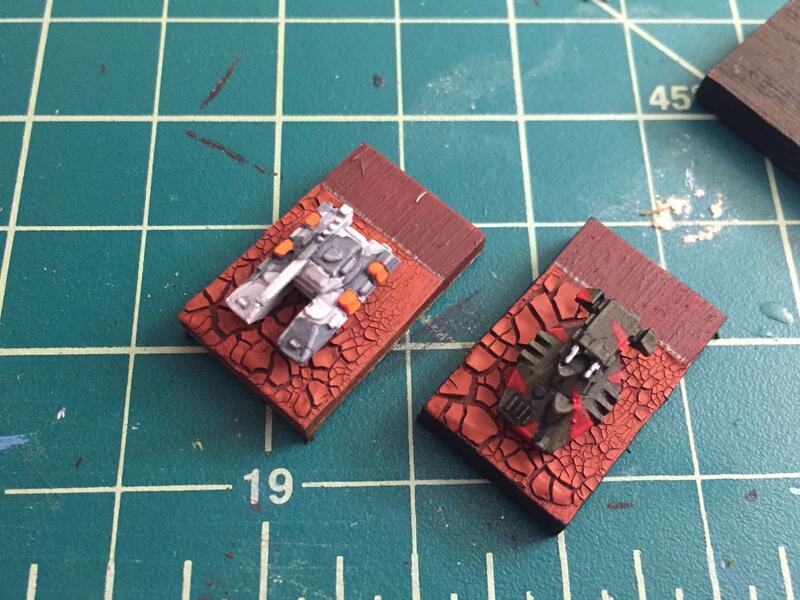 I stain my bases with red-brown ink, them just apply the stuff in a thick, uneven layer and it dries like this. It’s nice stuff and gives some easy but interesting base effects. I like the scheme of the two to the flanks. The mech also look good. A color test for the Mars Liberation Army. I wanted to try something unusual. I’m not totally sure but I kind of like it. The painting is excellent, as per usual, but I think the red on the hover tank is too close to the red on the base. Maybe go with a more brownish or orangish red? I was going for an “optic camouflage” but yeah I think it went overboard and I’m actually considering black as a contrasting color instead. Worth a shot though. I’m sitting on it for a while though – it actually DOES look like stealthy material on the surface of the tank, like it’s semi-cloaked. Which I kind of dig because the MLA is meant to be using technology they don’t exactly understand. 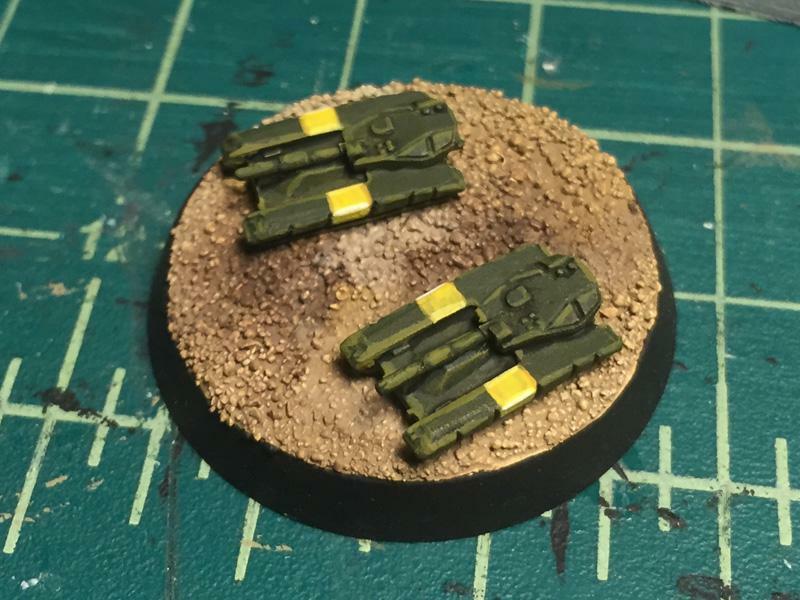 I have another scheme I’m trying that’s more obviously “stealthy,” a green-black that would make them look like antigravity F-117’s. We’ll see which I like better. 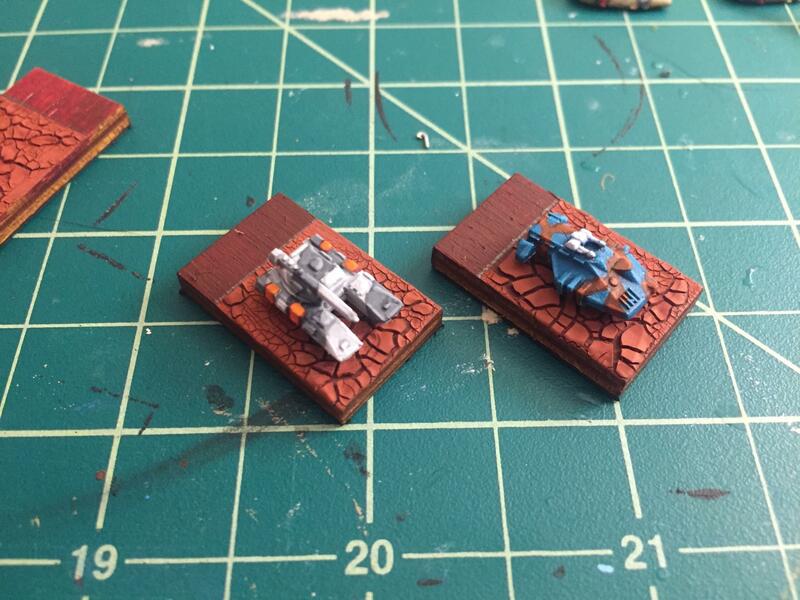 And some touch-up to the HSDF forces. Their militia’s tanks being built around retuned mining lasers on an armored earthmoving chassis, some slightly industrial colors seemed appropriate. Finally came back to base the First Cav armored force. I just cleaned and recalibrated my laser printer, so the base labels are nice and sharp again. 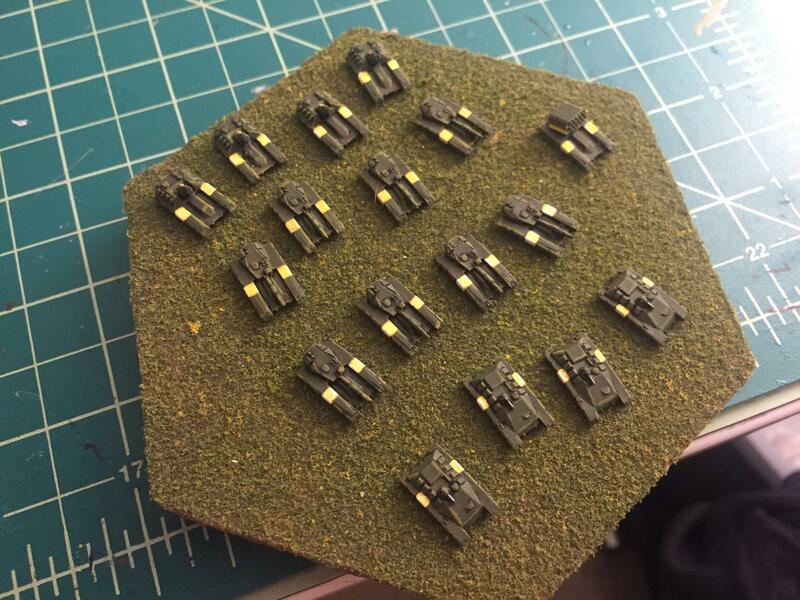 Inspired me to buy some for my 3mm Ogre set up! I like the design of the ID tag.